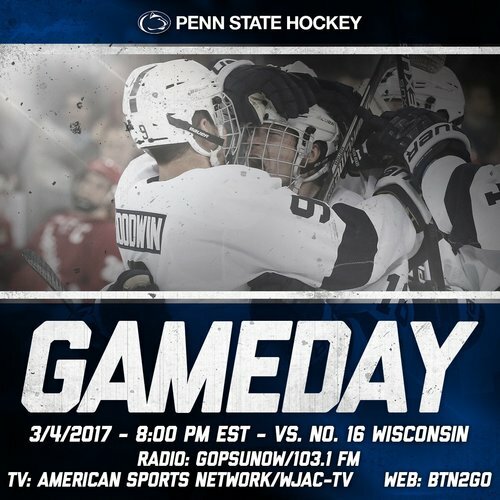 Just under half an hour away from puck drop for the finale between the Badgers and Nittany Lions. If UW can secure at least one point tonight, they will clinch a top-two seed and a first-round bye in the Big Ten tournament. On his pregame radio interview with @brian_posick , Tony Granato says Tischke probably would have played if this was a playoff game. Bruised. 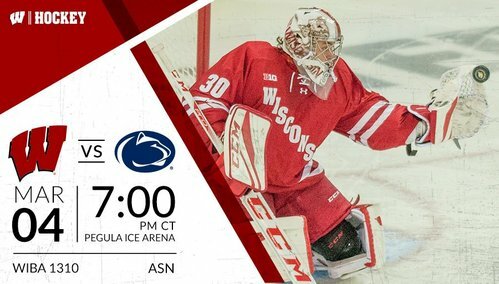 Watch #Badgers hockey on TV tonight -- Check here to find out where to watch ASN. Also on BTN2Go. 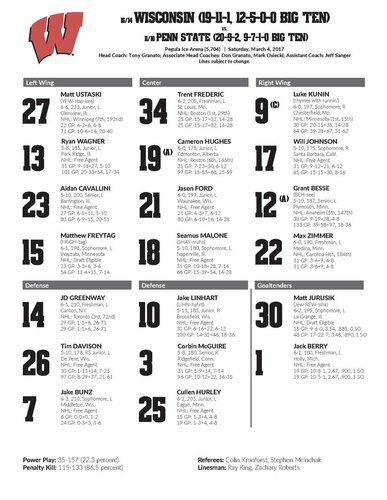 As expected, Matt Jurusik in net tonight for the Badgers. 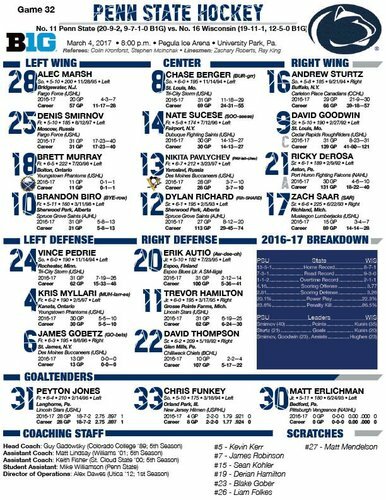 Regular starter Peyton Jones for the Nittany Lions. We're underway in Happy Valley! Five minutes gone by in the first period, and we are still scoreless. PSU leading SOG 6-3 in the early going. Update from Minneapolis: Minnesota and Duluth are tied 1-1 after regulation in the WCHA Final Face-Off semis. UW gets winner tomorrow. Badgers will have their first PK of the night as Cavallini goes to the box for tripping with 11:14 left in the first. NITTANY LIONS GOAL: Kris Myllari scores a power-play goal to give Penn State a 1-0 lead over UW. Third try close to the net. Penn State score on the power play to make it 1-0 with 9:16 remaining in the first. 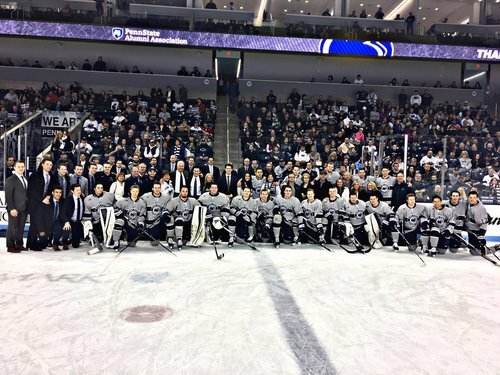 NITTANY LIONS GOAL: It's 2-0 Penn State as David Goodwin scores in transition as UW's defense falters. PSU adds a second to make it 2-0. 8:26 left in the period. 5:55 left in the first, PSU leads 2-0. 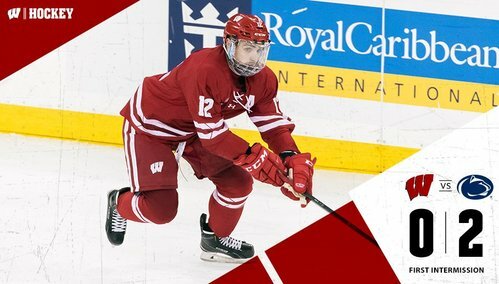 Badgers building some offensive pressure in the past few minutes but still trail 2-0 with 2:35 to go in the opening period. Wisconsin to the box on a cross-check with just 27 seconds left in the first period gives Penn State the PP chance leading 2-0!! Greenway sent to the box with 26.8 seconds left in the period. END 1: Penn State leads Wisconsin 2-0 on goals by Myllari (PP) and Goodwin. Shots on goal 18-11 for PSU. Badgers and Nittany Lions back out for the second period. PSU has 1:34 of power play time to start the frame. UW kills off the Greenway minor and teams are back to even strength. Good chance for Corbin McGuire but he is denied by Jones. 15:20 left in the period with UW down 2-0. Minnesota and Minnesota Duluth are done with the first overtime in the WCHA semis. Still 1-1. Nittany Lions score to make it 3-0 with 11:13 on the clock in the period. NITTANY LIONS GOAL: Penn State takes a 3-0 lead after UW's Jake Bunz swats the puck in his own net off a bounce. David Thompson gets it.